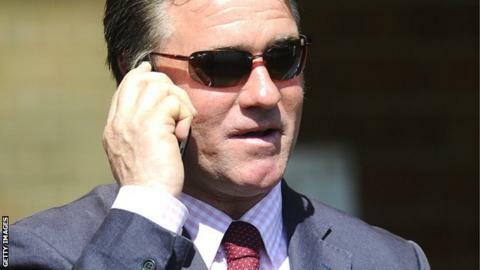 Trainer Gerard Butler has appealed after being given a five-year ban for injecting racehorses with banned drugs. The 47-year-old admitted injecting four horses with Rexogin, which contains the anabolic steroid stanozolol and is designed for use in humans. He also used the Sungate product on another five horses at his stables. A British Horseracing Authority spokesman said he had "appealed against the findings and penalties", which followed a disciplinary hearing. Butler was disqualified for five years after admitting last month to seven breaches of the rules of racing. "No date for an appeal hearing has yet been set. Butler will remain a disqualified person in the meantime," said the BHA spokesman. After adjourning for a decision, the disciplinary panel ruled earlier in December that the Newmarket trainer's actions were "an appalling breach of his duty to look after the interests of the horses in his care". Irishman Butler, who has been a trainer in his own right for 15 years, blamed "one disastrous lapse" after the panel's findings were announced. "It was wrong for me to cut corners but I did so principally through naivety," he said.